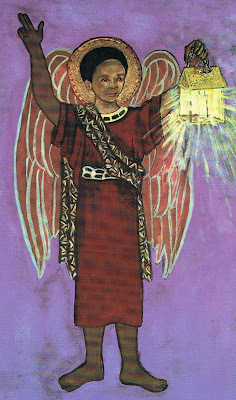 Today is the Feast of the Holy Archangels. The Gospel reading of the day reminds us to "become as little children." The priest at Mass today said this means we go to God each day with open hands saying, "Papa, what do you have for me today?" He continued to share that this feast is all about humility. God lowered and humbled himself in his descent to earth. This is what made many of the angels rebel. No one is more humble than a child. I am so blessed by little 4 year-old Annie at church who runs to me each Sunday with open arms to tell me she loves me. Her face looks like a cherub. I am struck deeply by her innocence. Thank God for his angelic heavenly protection for all his children. St. Michael, the Archangel, defend us in battle, be our protection against the wickedness and snares of the devil.